The blurb for Monica Byrne’s debut novel compares it to elements from the works of three authors. Often I don’t care for these kinds of comparisons, and never put much faith in them. In this case while I don’t particularly see the Gaiman comparison (and I don’t even recognize Morgenstern), the similarities in themes to Atwood are warranted to my mind. In terms of genre there is a match in literary style and depth with strong undertones of science (or Atwoodian ‘speculative’) fiction, where near-future technology ends up both drawing people together while leading to their exploitation or estrangement. There is also a strong sharing of themes, with Bryne here tackling complex biological and social issues of gender and sexuality, and to a lesser extent issues of spiritual faith. 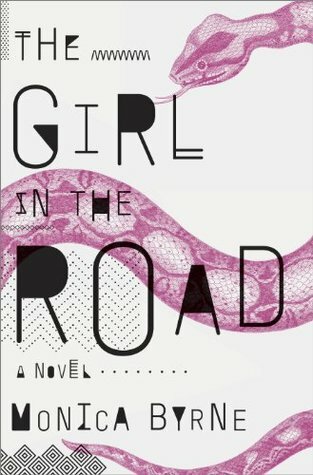 “The Girl in the Road” is actually a contrapuntal novel of two girls from two periods of time and two places (India and Africa). There stories are related in alternating chapters, but are intertwined both symbolically and ultimately in reality. Certain parts of it are written in a fashion that approaches magic realism, which may have engendered the comparisons to those other authors, but mostly the story resides in a speculative reality that feels familiar and emotionally fragile. With well-rendered moments of beauty, resilience, despair, and ugly tragedy alike, Bryne’s writing demonstrates a tremendous range in capturing mood and emotion. Although some may struggle through some of the more intense passages or may be confused by some of the more surreal moments, I think the novel is worth making the effort to work through them each. I do wish the closing chapters of the novel had been more drawn out; the ultimate convergence of the two storylines seemed to happen to rapidly given the slow establishment of each thread and the journey to reach their meeting. This is, however, a minor quibble with what is really a consistently captivating and purposeful novel. I highly recommend giving it consideration to read.